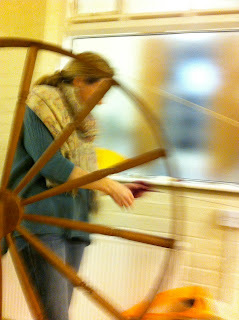 We have had a lot of discussion in our house about how Sleeping Beauty actually came to prick her finger, we have studied the many spinning wheels we know and couldn't fathom the fairytale. 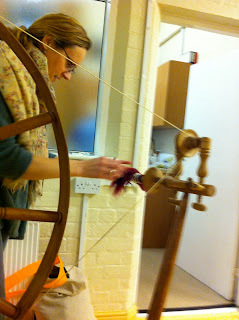 That is until Dora brought along her Great Wheel and gave us a demonstration of Long Draw Spinning at Stafford Knot Spinners. It's a massive wheel that you have to stand up to work and the spindle is a great big dangerous looking spike. I'll stick to the knitting.